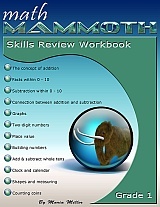 Math Mammoth Grade 1 Complete curriculum - description, samples, and purchase info. Math Mammoth Grade 1 Complete Curriculum gives you everything you need for 1st grade math. It is available both as a download version and as printed copies. You can purchase Math Mammoth Grade 1 as a digital (downloadable) version, on a CD, or as already printed books. You can purchase a lesson plan for Math Mammoth Grade 1 to use it in Homeschool Planet online planner. Learn more. The chapter on coins (chapter 8) is included in seven currencies: US, Canadian, British, European, Australian, New Zealand, and South African money. You will automatically get all these versions when you buy the digital version of Grade 1 Complete Curriculum (download or CD). BONUS! The download or CD version also comes with BONUS Soft-Pak programs. The 6 programs in Soft-Pak (4 math, 1 language arts, 1 list maker) offer both on-screen and printable activities in a low-graphic, high content format. Read more and see screenshots. Check out the table of contents for 1-A and 1-B (sample files) to see the topics covered in more detail. For $9.95, you can purchase a lesson plan for Math Mammoth Grade 1 in order to use it in Homeschool Planet online planner. Learn more. Math Mammoth Skills Review Workbook, Grade 1 provides additional practice for the topics in Math Mammoth Grade 1 curriculum. I recommend you only purchase it once you are sure the student does need supplemental practice. Learn more. A 100-bead abacus (for 1-A and 1-B; especially the chapter on place value and chapter 7). Read more here. An old-fashioned alarm clock or other analog clock where you can turn the minute hand, and see the hour hand turn (for 1-B). A ruler that measures in inches (for 1-B). A ruler that measures in centimeters (for 1-B). Math Is Happy Again — by Meredith at From Meredith to Mommy blog. Math Mammoth Review by Heather at Running with Spears blog. I just wanted to take a moment to express how grateful I am to have found Math Mammoth — it has been such an enormous help for both of my 1st graders. They enjoy it and have sailed through, but have also learned and retained so much. By far my favorite math curriculum — I suggest it to all of my homeschooling friends. Such a better value in every way than Math-U-See!!! I just have to tell you what a wonderful year we've had with Math Mammoth! We are about 2 weeks out from finishing grade 1, and my daughter & I are both excited about moving on to grade 2. We switched in November (at that time, you gave me some placement advice... thank you! ), and since then, my daughter has become quite the lover of math! Before MM, we were using Christian Light Education, and she would whine and cry almost daily when it came time for math. She knew the material, but it was pure drudgery for her. Now, thanks to you & Mathy (we had to get our own Mathy! ), she even asks if we can do math first each day! It's clicking with her, and she is so proud when she's able to quickly answer a problem mentally. We love the lesson plans for Homeschool Planet, and each day, she's excited to see if we have a video or game to go along with our lesson. I truly can't thank you enough. 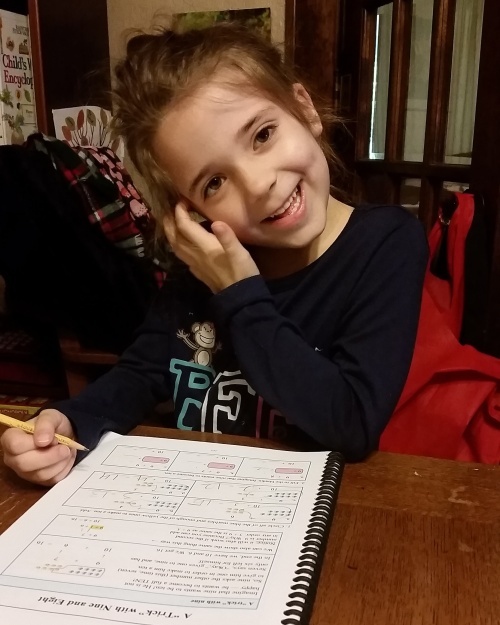 Math Mammoth has made such a difference in our homeschool. This is hands down my favorite option for Math for my 6-year-old son. We have used both the light blue and blue series. My son is able to work through the assignments independently by reading the directions and examples for each lesson. If he needs clarification I am there to assist him but he is able to do most of the assignments independently. I also had a question about an assignment that I sent to Math Mammoth. I got a personal detailed response from the owner. This is an easy to use, open and go curriculum. I LOVE this program. As a former math teacher with my masters also in math education I would highly recommend this program at least based on what we have experienced so far in 1st grade. My daughter is enjoying and is improving every day with her math facts. This is definitely a mastery based curriculum which I support. I just wanted to thank you for this excellent curriculum! I tried 3 different 1st grade curriculums for my daughter and none of them were working well for her. Math was just not clicking. I got the entire curriculum (to use for both her, my younger daughter and my numerous tutoring students). She started 1st grade on February 3rd and she will complete the entire 1st grade course (workbooks A & B) by April 25th! (An entire grade in under 12 weeks!) She finally understands the concepts, and now math is her favorite subject! The students I tutor are also benefitting from the curriculum and love how everything is explained. Math was never my favorite subject in school, and (like my daughter) I now LOVE it and am seeing math in an entirely new light! Thank you! I don't know what it is about Math Mammoth that makes it work, all I know is that it works. After just a few weeks starting from the first book of first grade, I went from having a 2nd grader who couldn't add or subtract, to a 2nd grader who loves making up math problems and solving them for fun. We are a homeschooling family with a 6-year-old boy who loves math. We used Math Mammoth grade 1 last year. I made "math packets" for him to complete on his own. He LOVED working on them! I want to thank Maria and everyone else behind the Math Mammoth materials. We look forward to starting grade 2 soon. I just had to send you a note saying how much we appreciate your workbooks. My 6-year old son is in kindergarten and has gobbled up the Grade 1 curriculum to the point that we are done with the whole set already! Your books and his learning style has really meshed and I am so happy to have discovered these books! I have to tell you that now as we draw grade 1 to a close I am so impressed with Math Mammoth. My son who hates worksheets, has learned so much. Wish I had learned math with your program when I was a child. Amazing to see how you lay the groundwork for the understanding of complex concepts. I am so glad that I stuck with Math Mammoth. I tell everyone that asks to use Math Mammoth. Several of my friends have purchased your program after listening to me talk about Math Mammoth. Everyone of them was uncertain, but have all come back to me and raved about what a great program Math Mammoth is. I have to say that another of my favorite things about Math Mammoth is the fact that my son can understand what to do usually on his own, after reading the instructions. Thank you for putting together such a great program. Hi Maria, I have been using Math Mammoth with my 5 year old for about 6 weeks. I sensed he was ready for "formal" math when he started writing math facts on blank sheets of paper. I have been using Singapore Math for 2 years with my 8 year old with much success. I like SM, but just didn't think it was quite right for Michael. I am discerning when it comes to math curriculum because my personal background is in math. My undergraduate and master's degrees are in math education and I spent nearly 15 years teaching math in middle school, upper school and college in both private and public settings. I co-authored an algebra text for use in the independent school in which I taught for 7 years. We finally decided to create our own text after a 2 year search for a book that covered the topics we wanted to teach using our preferred methods. I know firsthand the importance of a solid early foundation in mathematics and have sadly witnessed all too many students struggle (perhaps unnecessarily) due to a less-than-stellar math background. Needless to say, I want a top-notch curriculum for my own children. I have found that with Math Mammoth. I respect your background as a math educator and sense that we share the same desire for children to get a good foundation in the basics as well as learn to think and problem solve. We are working through the first grade light blue series. My son loves the worksheets. They are much more than drill and practice. They emphasize the concrete with the abstract by offering not only math fact practice, but equations and inequalities which will prepare him for algebra later. I like how the facts from 1-5 are mastered before moving on to sums to 10. Children learn real number sense when they work with small numbers first and build up to larger ones. We have finished our work for the day on several occasions, gone out for our extracurricular activities and come home with Michael asking if we can do some more math. I purchased the light blue series for grades 1-3. I plan to finish Singapore Math with my 2nd grader and make the switch to Math Mammoth for her in 3rd grade. Anytime someone posts a request for a good math curriculum on The Old Schoolhouse or Home Educating Family Facebook page, I immediately recommend Math Mammoth. When my son got frustrated one day and marked on his paper, I found another thing I love about MM; I can print another page since the file is on my computer. Thank you for producing such valuable and affordable resources for homeschoolers. I hope your business continues to grow and flourish. I am thoroughly satisfied beyond any expectation with this curriculum. I have purchased other math systems, and they have failed us. I love that I can have confidence my home schooled children are learning everything they "need" for a certain grade level, and I can work ahead or skip around a little based on how/what they are learning and how fast, individual interest etc. Homeschooling presents enough obstacles, but you take the guess work out of the question so many of us have, "am I teaching them everything, enough, too much, etc?" I just adore the work you have done, and truly appreciate the too-the-point style of worksheet, because it gives me the "what" to teach, and then I can spend more time on making certain lessons creative based on MY kids learning style. My husband who is an engineer and highly skilled in math, also appreciates the curriculum as he often looks at other programs and wonders why the wheel must constantly be reinvented. I did not understand math until college when I had a great professor and a tutor, and I am elated that my children will grow up appreciating numbers, and understanding the importance of the critical thinking skills they are attaining on their own and through my teaching based on your math lessons. Thank you and thank you! I purchased the Light Blue series for grade 1 back in May for my 1st grade son. He has SPD and fine motor issues. Previously, we worked through Singapore for K. While he loves math, Singapore really was too colorful and chaotic for him. When I handed him his first MM worksheet back in May, he went crazy. He did 5 pages the first day! He really loved the simple layout. After a summer break, we are 8 weeks into the school year, and math is still his favorite part of the day. He loves the puzzles and addition tables. Even though he doesn't like to write and will often ask me to write the answers, he will *always* fill in a full addition table all by himself. I really think MM is the perfect fit for him, and his 4-yr old sister is always on my lap waiting for her turn to do math too. I love your focus on number relationships and the consistent practice of sums. I can tell that future calculations will be much easier because we have really drilled on the different ways to make 10. My son just turned 4. We have been playing with numbers for a while now. He knows how to write numbers 1 thru 100. So, wanted to take him to the next level. I tried to teach him additions and substraction, grouping etc. but it was not working. After doing a lot of research, I decided to get Math Mammoth. We got the light Blue series as it's structured, affordable (in case it doesn't work I am not wasting lot of money) and it has lot of fun games which is what he needed and links to a lot of useful resources are listed at the start of each lesson. This way I was not wasting lot of time browsing the net, this is what I needed. As suggested in the book, we are playing with blocks, rocks, abacus and now he understands a lot of concepts which I would have skipped if I didn't have this curriculum to follow. We are going at a slow pace as he is only 4 but he is getting used to all kinds of manipulatives like the number chart, number line, rods, clocks the list can go on... all these fun activities are giving him a very a solid foundation which would have been hard for me to do without this structured curriculum. Best of all, we both are having fun time together learning without him knowing that. I am glad I found this program early on. Thank you for putting it together. Hi, big thanks for making the Math Mammoth curriculum! After completing another curriculum and having my daughter not "get" addition, and having math time be akin to torture, she is LOVING Math Mammoth and begs to do more!!!!! Hi there, I have to say, I'm thrilled with the work books! When I pulled my girls out at the end of March, my 6yo couldn't remember any additions, it was all counting on her fingers, now while she still uses manipulatives, some she just remembers. Subtraction was such a foreign concept, it was instant tears. Now, she walks around the house chanting math sentences. She thinks it is FUN! We have been using Mathmammoth for three days so far and my daughter L-O-V-E-S it. We started with book 1A on page 10 or 11. She is in second grade this year. However, last school year her teacher neglected to teacher math AND neglected to tell me that my daughter could not add or subtract. Your math curriculum is truly a blessing from God. She has learned more using this program than she did when we used Saxon and Math-U-See. In addition, it is fun, easy to follow, and easy to teach. We had become so frustrated with math that I stopped teaching it altogether. Now, she is excited and ask when to work on math. THANK YOU!!!!! I just wanted to tell you how HAPPY I am with Math Mammoth! I have two kids who are doing the Light Blue Series 1-A and one child who is in 1-B. They LOVE it! I CANNOT believe how easy and thorough it is for only $30/year!!!! I'm so thankful that I happened to find you on the internet and decided to take a chance and buy the 1-A! If my kids don't quite grasp something it is so easy to just go back a few pages and re-print them. I also love the computer games that you have searched out for me and given the links to. So thank you, thank you, thank you!! All I can say is that I am SO happy we went with this program!! WOW!! We pulled my daughter out of school this year as we were not happy with how things were going for her. She should have been in the second grade. I was not happy with her math skills at all and when she took the math placement test it showed she needed back in first grade, with a 31%. She finished the first grade work today and took the final test and scored a 90%!! What a difference!!! She is so proud of herself!!! I think what made me feel more confident on going with your program out of some of the others I had looked at, was when I did have a few questions, you emailed me back personally. Not many other places do that. I also liked your videos on youtube, those were helpful! Keep up the great work! Review of Math Mammoth Grade 1 Complete Curriculum from Learning As I Go... blog. I just wanted to tell you how HAPPY I am with Math Mammoth! I have two kids who are doing the Light Blue Series I-A and one child who is in I-B. They LOVE it! I CANNOT believe how easy and thorough it is for only $30/year!!!! I'm so thankful that I happened to find you on the internet and decided to take a chance and buy the 1-A! If my kids don't quite grasp something it is so easy to just go back a few pages and re-print them. I also love the computer games that you have searched out for me and given the links to. So thank you, thank you, thank you!! Three weeks ago, I bought Math Mammoth for grades 1-2, and I've been evaluating it with my 8-year-old since then. I have been homeschooling for 19 years, and I must say this is one of the best elementary math programs I have seen yet. I have used many different curriculums before, and I find that Math Mammoth combines the best of several. It has the built-in review of Saxon, the uncluttered feel of Miquon, and the incremental, step-by-step skill building of Developmental Math. What I like most about it is that, unlike some other programs, the math facts memorization is built into the program. With every program I've used except Developmental Math, I have had to interrupt the study sequence to focus on memorization drill. Math Mammoth accomplishes this key skill with more clarity and ease of use than I've found in Developmental Math. Thanks again for a great program--I look forward to using the upper levels in the future! We like Math Mammoth because it's very clear, logical, mastery-based and easy to use. It's pretty much like Singapore, but with a lot more practice. We use it as a supplement to Right Start Math which has an approach of manipulative --> abstract. Math Mammoth has an approach of pictorial --> semi pictorial --> abstract. I found that the pictorial presentation of Math Mammoth helps a lot to cement a concept. I could've supplemented RS with Singapore which I did during the K-year, but our concern is that Singapore does not has that many practice. Secondly, the scope and sequence is much too different from RS, because it introduces multiplication and division pretty early, whereas Math Mammoth s & s is pretty in line with RS. And thirdly is the cost. I don't want a supplemental program which costs a lot. Math Mammoth fits the bill. It's really a low cost high quality program.